January 24, 2018–The Movistar Yamaha MotoGP Team showed off its 2018 colour scheme today at the Casa Del Lector, Matadero, giving a foretaste of what’s to come. The focus of the 2018 Movistar Yamaha MotoGP Team Presentation event was set on celebrating the start of the new season, rather than commemorating past achievements. Eager to take on the challenge to push the limits even further in 2018, the two companies unveiled a new team logo that shows Movistar’s new colour scheme. The event soon welcomed new Yamaha Motor Racing President and General Manager of the Motor Sports Development Division, Kouichi Tsuji, to the stage for a Q&A session. He shed light on how Yamaha is working on pushing the limits, before it was Movistar Yamaha MotoGP’s Team Director Massimo Meregalli’s turn to discuss the 2018 preparations and how the team aims to rise to the challenges ahead. 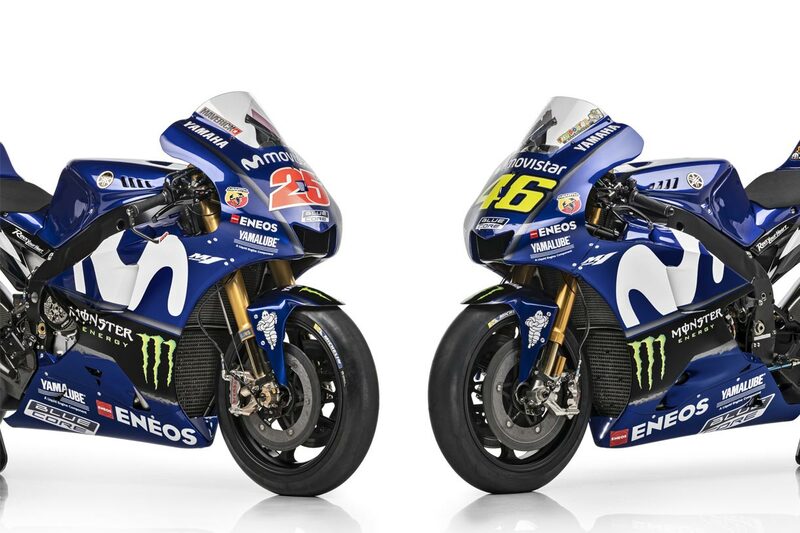 Valentino Rossi and Maverick Viñales proudly presented their new bikes with a refreshed livery. Besides a revamped Movistar logo, the “Movistar M” design element on the bike is now white, making it blend in perfectly with Yamaha Factory Racing’s aesthetics. The team is also pleased to announce that, after introducing slogans of Yamaha Indonesia Motor Manufacturing (Semakin Di Depan, or “One Step Ahead” in English), Yamaha Motor Vietnam Co., Ltd. (“Go Beyond”) and Yamaha Motor Philippines, Inc. (“Blue is Fast”) on the M1s last year, Thai Yamaha Motor Co., Ltd. will also be featured on the bike in 2018. Furthermore, Movistar Yamaha MotoGP is delighted that Software Cradle Co., Ltd. has joined its sponsor line-up for 2018 (until 2020), and that it can also confirm the continuation of its numerous sponsors and partners. Lastly, the team continues to support Yamaha’s bLU cRU programme, encouraging a younger generation of on-road riders to follow their dream to become the next MotoGP star. The initiative provides a safe and professional environment for young riders to develop their talent. 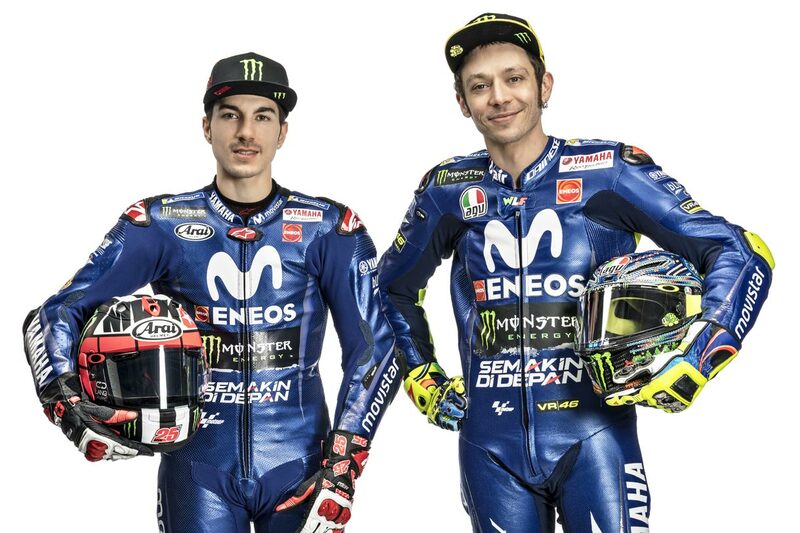 Rossi and Viñales continue to be ambassadors of the programme and will serve as role models for the riders in lower classes. “We are honoured to start the fifth year with our title sponsor Movistar - a brand that has great heritage in the MotoGP championship. We enjoyed really important and very positive moments in the first four years of our collaboration. This year we launched the new 2018 bike in Madrid again, close to the home of Telefónica Spain. From this moment on we begin a new season, with a fresh livery and an updated team logo, to highlight the union between Yamaha and Movistar as well as to mark the beginning of this new chapter. “First of all, I want to say that I’m really sorry to have missed the team presentation event due to some health problems. The team came to Madrid again this year, to be joined by Telefónica Spain for the unveiling of the new team colours, before embarking on the 2018 season challenge. This will be the fifth year that our team continues its partnership with Movistar. The collaboration has led to many successes in the past, including the Triple Crown in 2015 and the Team Title in 2016. We have celebrated our achievements together, but we also learned together when things didn’t go our way. “During the upcoming pre-season testing we will not be sitting still either. We see the start of 2018 as chance to start afresh. We’ll be taking new opportunities with both hands and have set the goal to push ourselves that bit further. “After more than two months of waiting, we are finally kicking off the new season. I’ve been working hard to prepare for the start of the new season and I’m looking forward to riding my M1 again. The bike, the new colour scheme and also the new team logo look good, so judging by the looks of the team, we are ready to begin testing. “Last year we had a really strong start at the first few rounds and we finished third in the championship. This year we’ll try to improve on what we did last year. We have a really good team, so I think it’s only natural that we aim for the win in every race and ultimately for the championship title, but of course we’ll only achieve this if we stay focused every session and push as hard as we can.